Here's page three of our Pittsburgh Courier section featuring the adventures of Don Powers by Sam Milai. Milai was was one of the mainstays at the Courier; he did comics for them from 1937 through at least the early 1960s (his work appeared there until the early 70s but the later material was most likely reprints). In this strip Milai shows himself to be a fan of George Wunder; many of the faces are drawn in Wunder's distinctive style. 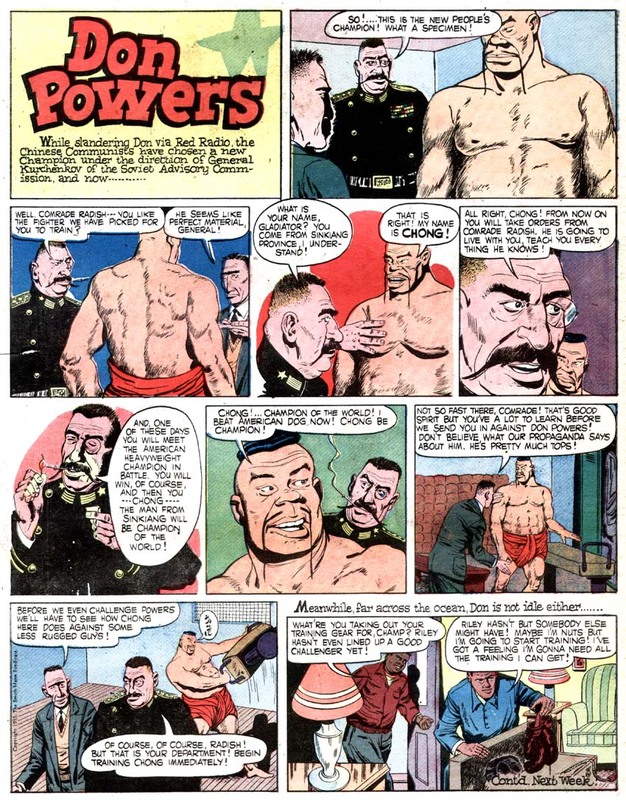 Don Powers is yet another strip that was created especially for the color section - it started with the first issue August 19, 1950 and ran through the end of the color section in 1954. The strip then continued on as a black and white daily style feature until November 1, 1958. 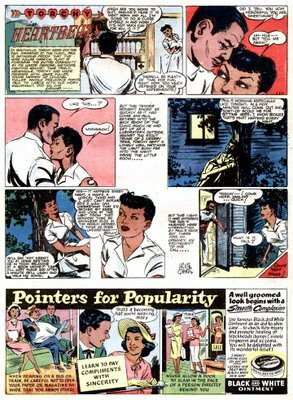 Jackie Ormes' Torchy in Heartbeats hits on all cylinders as an interesting obscurity. Ran in a black newspaper, written and drawn by a woman, and the subject is romance. That's like the unassisted triple play of rarity in newspaper comics. Torchy in Heartbeats started with the color section on August 19, 1950, and outlasted the color section by a while, ending September 18, 1954. The strip also had a paper doll topper called Torchy Togs, which here in our example was bumped in favor of an ad (the ad is pretty interesting, though). Jackie Ormes created her Torchy character much earlier in a series titled Torchy Brown in Dixie to Harlem. This strip ran in the Pittsburgh Courier 5/1/37 - 4/30/38. Ormes' longest-running series, though, was a humor panel titled Patty-Jo 'n' Ginger - that one ran in the Courier for over a decade starting in 1945. The ad for Black and White Soap is a typical example of the preaching that went on in the black papers of the time. All through these papers -- not just in ads -- were constant reminders to use good manners, dress properly and generally behave in a manner that reflected well on the black community. Most papers took the philosophy that good manners were vital in the cure for the racism endemic to the U.S. This preaching went out of favor in the newspapers by the 60s, but was harped on constantly before that. Quite a few comic panels in the black papers had this as their subject matter, for instance As Others See Us and Folks We Can Get Along Without. It's been years (since that reprint in Nemo No. 28, in fact) that I've wanted to see this strip in color. Thank You! I still hope somebody will reprint this someday. 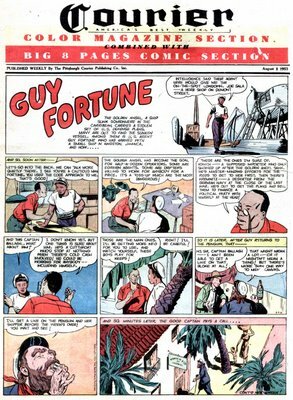 An interesting genre of newspaper comic strips are those that ran in the black papers; that is, newspapers intended to serve the African-American segment of the population. Most larger cities have a black paper, or did at one time. Some of the biggies were the Chicago Defender, the Pittsburgh Courier, the Atlanta World, the Baltimore Afro-American and the New York Amsterdam News. All these papers dabbled to one degree or another in comic strips, and several of them even syndicated their comic strips to the smaller papers of other cities. Unfortunately the history of black comic strips is necessarily sketchy. Most of the creators are long dead without having published memoirs or given interviews, and the microfilm records of the papers themselves are in a terrible state. I have done what I could by indexing the material in most of the major papers; but even my indexes are incomplete because microfilm versions of the papers are incomplete, mutilated, or just so badly photographed as to be indecipherable. The comic strips of the Smith-Mann Syndicate, apparently run with or through the Pittsburgh Courier, have suffered because of the poor microfilm record. The Smith-Mann color comic section is the only such section ever to be attempted for black papers, and the microfilm of the Pittsburgh Courier (at least the version I've indexed), the only paper known to have run it, is missing the majority of these sections. The Smith-Mann color section was definitely offered in syndication, though, so perhaps lurking out there is another paper that ran it, and perhaps in that case it made it intact through the microfilming process. I hope so, but I think the chances are slim. Over the next week or so I'm going to present all the comics from a rare copy of the section that I recently acquired (only the third I've found, though I've been searching them out for years). The date of this section is August 8, 1953. 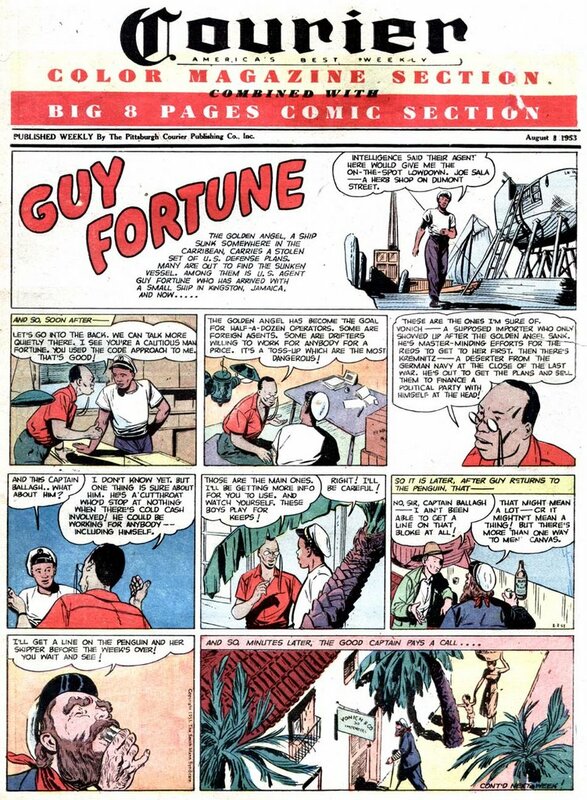 Our first strip, from the cover page of the section, is Guy Fortune by Edd Ashe. This strip ran from the inception of the section on August 19, 1950 through October 22, 1955. The color section ended in 1954, but the strip continued in black and white after that.